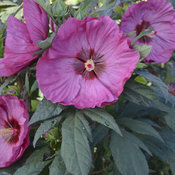 Huge 7-8”, ruffled, lavender pink flowers with a cherry red eye are produced all over the densely compact, shrub-like clump of attractive midnight green foliage. 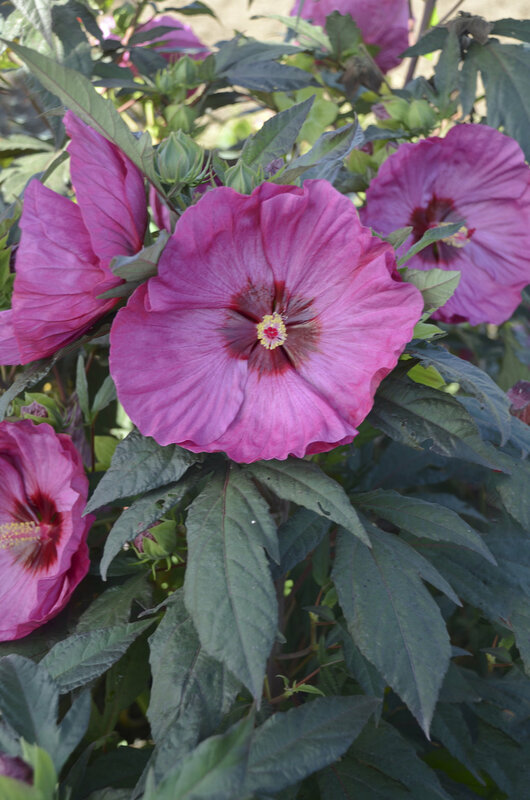 Hibiscus love the sun and need moist, well-drained soil. 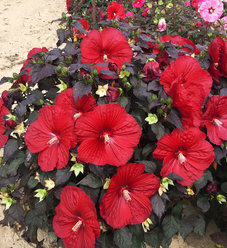 Keeping these plants watered will result in larger flowers and lush foliage. 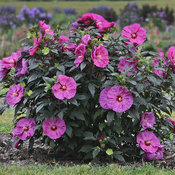 Deadheading will improve the appearance of the plant, but is not necessary for continued bloom. 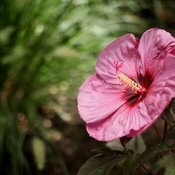 It is best to plant Hibiscus in the garden before the heat of the summer arrives, and should be heavily mulched the first winter. 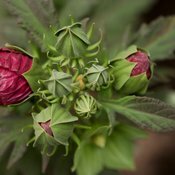 In spring, cut back any remaining stems before new growth appears. Do not trim back in fall. 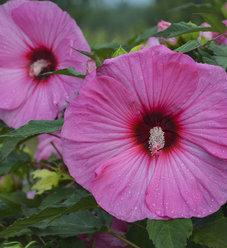 A strong pair of loppers or a saw will be necessary to cut this plant back. 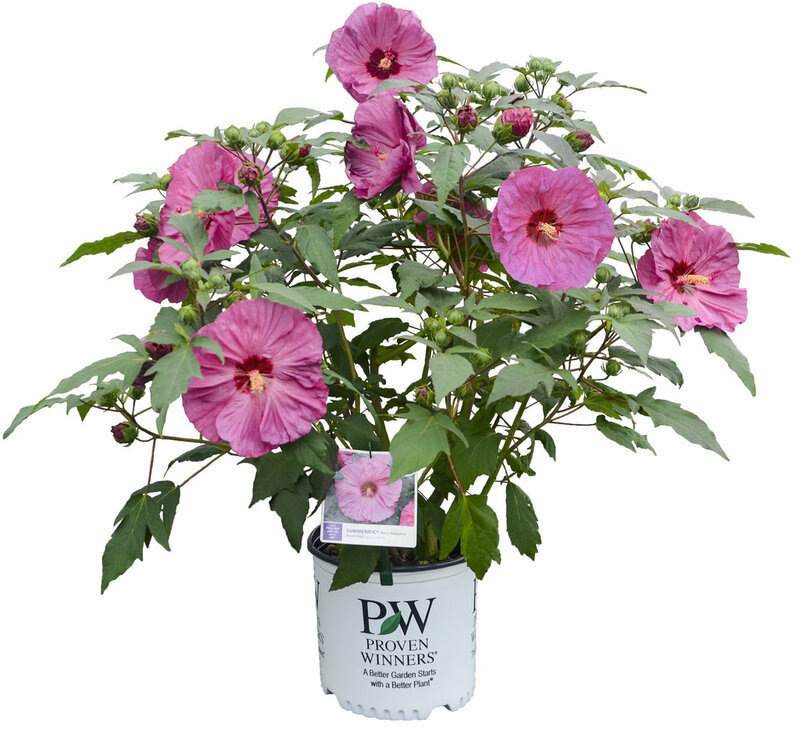 Be advised that Hibiscus is always one of the last perennials to emerge in spring. Be patient, even if you think it is dead, it most likely isn't. Its vigorous growth rate more than makes up for this late start, however. Japanese beetles find these plants especially delicious. 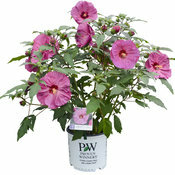 I got this plant last year at an end of the year sale at Loews for $5.00 and grabbed it. It barely had any leaves and looked kind of sad but I thought with some TLC before winter and a good layer of shredded leaf mulch it would survive. 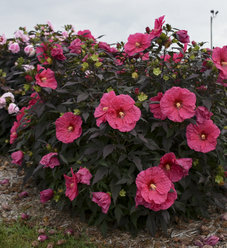 Plus I live in Zone 5 Upstate New York and Lake Ontario gives us plenty of Lake Effect snow in winter and so between the leaf mulch and snow cover I had a lot of hope. I was so excited this Spring when I saw the new growth coming from the ground! The garden I planted it in is a moist/wet area of my yard and with the abundance of rain our area has had this summer it has been a happy plant. 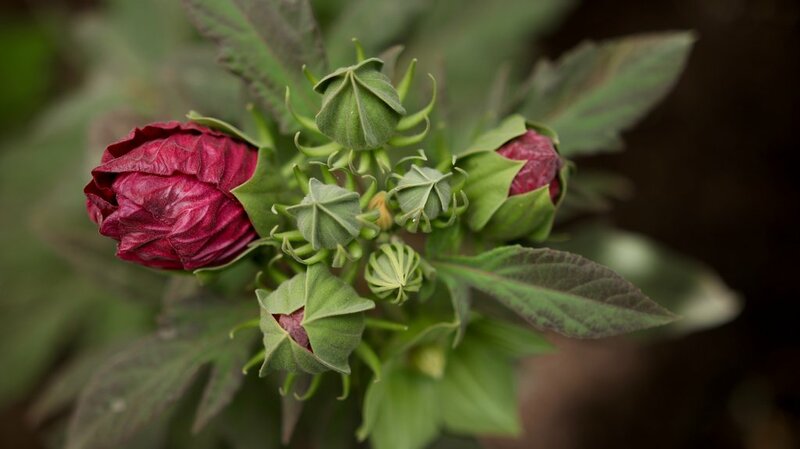 Right now it is loaded with buds and the flowers are starting to open. 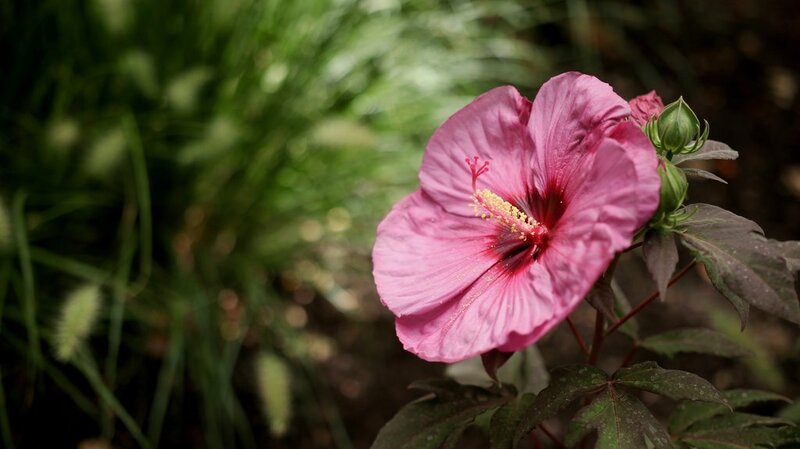 The color of the flowers in combination with the dark blackish green maple leaves is a beautiful combination. 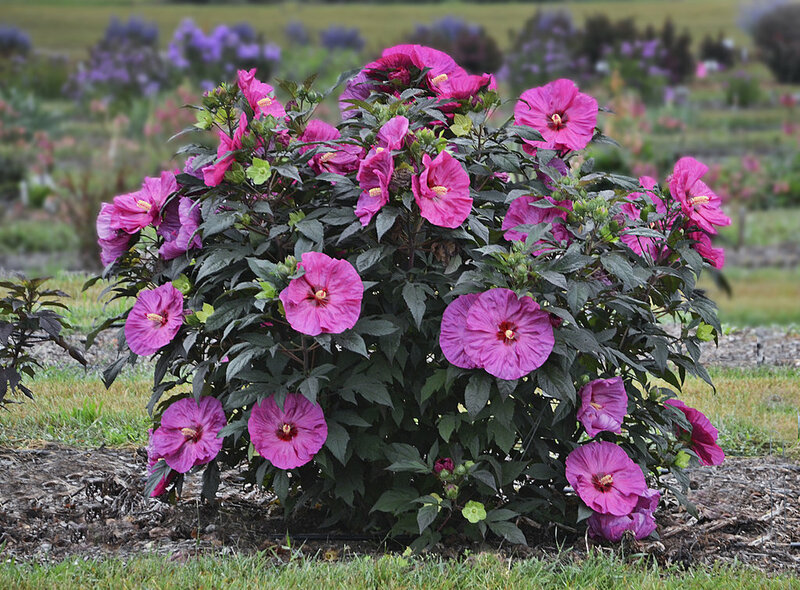 I also like that it won't get so big as some hibiscus get. Now I want another one!!! I am glad we found each other!